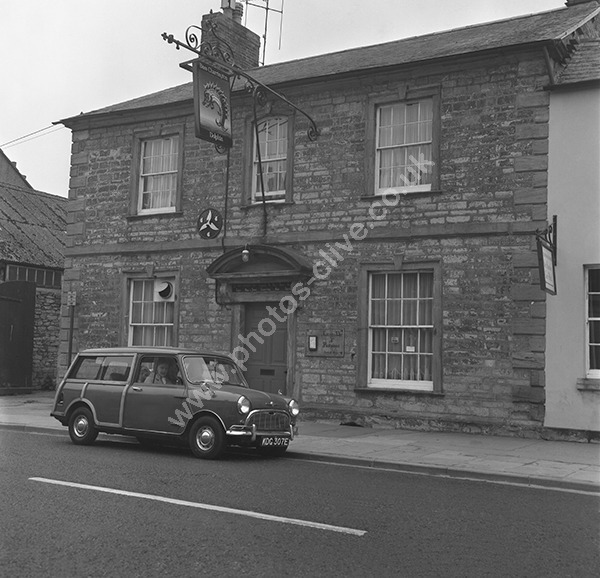 The Dolphin Inn, 32 High Street, Ilchester, Somerset BA22 8NH pre 1975 and with a Mini Countryman outside (two women and two children looking out) registration plate is KDG 307E so was registered in 1967. The license plate above the pub door appears to read the licensee as Derek Frederick Lee. For commercial use of this photograph please visit www.alamy.com and search for AEE4AG but for a one off print, please see below. Location: 32 High Street, Ilchester BA22 8NH.